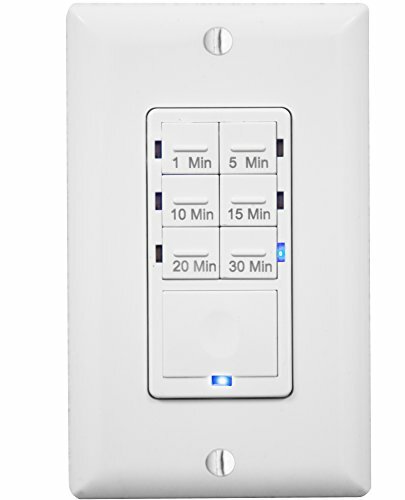 Enerlites HET06A is a 7-button countdown in wall timer switch with six time delay options giving great flexibility in light, ventilation fan control in bathroom, pantry, closet, laundry room, garage and more. The wall switch timer is ideal to control ventilation fan, ceiling fan and light in bathroom and laundry room where light and fan could be left on for a long time. By simply pushing the button to set your desired time delay from 1min, 5min, 10min, 15min and 30 minutes, your appliance will automatically turn off and never be inadvertently left on. Replace the normal switch for energy saving and convenience. By using the timer switch to control fan and light in the bathroom and laundry room, people have no worries that the fan might be left on for long time after shower. It is so convenient to just push the button and leave. The modern designed of the in wall countdown timer is designed to utilize current wiring and to replace an existing wall switch to control ventilation/ceiling fan, light and motor by setting the countdown time. This fan timer switch works with any household ventilation Fans including Panasonic whisper ceiling bathroom fans, ceiling mounted fans and bathroom vent fan with light. Beautiful bright blue LED indicators show the chosen time delay of your timer and STAYS ON for easy locating in dark. Use HET06A timer switch to control ventilation fan to keep bathroom/laundry room fresh, mildew and mold away. For bedroom light/ceiling fan control, use HET06 timer switch with 5min to 4hours time setting is ideal. HET06A-R also has time override feature and regular ON/OFF function with the big button. Bathroom exhaust fan and light control: HET06A+TDOS5 Sensor Switch For bathroom, multi-gang HET06A timer fan control with a motion sensor as light controller fits in any standard wall box and can be multi-ganged with other devices. Neutral wire is required for installation. Single pole application.